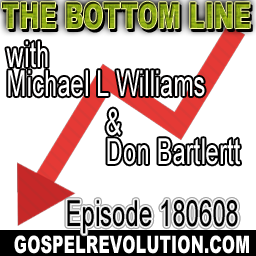 What exactly IS the bottom line of thye Gospel? Is it about making money as one contributor this week declar4ed? We had as bulging email bag this week and if you don’t get the Gospel by the end, we recommend listening again. Contributors this week included Gordy Lister,Quintillion, James Forehand,RobCrazyKeys, Theophilus Likhi, Randy French, Don Wynn, Todd F Bailey, Mark Kennedy, Ray Allen, Mike Nathan and Doug Salonen. Topics covered include, James the Jerk, date for writing of Revelation, spiritual child abuse, are unicorns in heaven, the curse of Christianity, the fiery pit – what is it? , the Gospel is God’s power, why we still die, how to start a group, and echoes of Bernie!